The Mozilla Uganda Community continued to inspire many through its’ amazing work of teaching the open web. As 2015 closed down, their latest adventure saw them visit one of the prominent institutions of higher education in the country’s capital. Ndejje University welcomed a team of 6 mozillians in their premises to conduct a one-day workshop whose main objective was to introduce and train students open web technologies which would later on see them develop and implement ideas for the open web. The workshop was organized to give talks, demonstrate Firefox OS technology (Mobile Operating System), run code tutorials and hack around open web applications. in a computer lab looked on, the introductory phase psyched up the audience with a talk on the mobile operating system owned and developed by Mozilla called Firefox OS. During this phase, the students interacted with the Session Lead as they asked a lot about the uniqueness of the OS and why it stood out in comparison to the existing OS’s in the market i.e. Android, IOS and so on. Apparently, the Mozillians carried Flame devices which ran the Firefox Operating System, they passed them around and each of the participants got a chance to check out the devices and explore the slik Firefox OS skin and its running apps. It was then, that a live demo of a firefox OS app (SaveNotes) was presented, key functionality of the app was highlighted, the apps’ code base was later distributed to give an insight of what entails an open web application. The hands on session as many technology experts would call it took center stage, the necessary development and testing tools were installed on the machines and every one geared in for the next challenge. The development and testing environment included Notepad ++ (A text editor for writing code), Latest Mozilla Firefox browser and the Firefox simulator (for testing the apps). As the Session Lead wrote lines of code reflected on the projector, the participants followed suit on their machines. They began with a simple HTML file, designed it with CSS and later added logic using Java script. With the help and guidance of the facilitators’, every student managed to at least design a web page, Nevertheless majority were able to create a validated form that would register a students’ Name, Number and email address. We then went for a 30 minute lunch break to grab some snacks, drinks and cool off the heads subsequently. The afternoon got more exciting for the students as they were getting ready to test their apps in the Firefox OS simulator on their machines, but before that, they needed to create a manifest file, a file which the Session Lead deemed so important, he said it’s the file that tells the OS what the app is all about. The facilitators’ ran around the lab helping the various teams come up with this file. Soon as they were done with it, they ran the apps in the simulator. Next up on the agenda, was brainstorming ideas and thereafter implement them. Participants were served sticky notes on which they wrote their ideas which were later categorized into Health, Education, Business, Entertainment and Utilities. As the workshop came to an end, the facilitation team came to a conclusion where each mozillian would lead a category for purposes of mentoring the participants during the idea implementation. In great appreciation, the participants applauded the visiting Mozilla team for the time they took off to conduct the workshop, and were indeed not just impressed but they were challenged to explore the open web for it was the first encounter with the technologies for many. In return the Mozillians thanked them for attending and departed happy and proud for having accomplished the job they had for the day. You could call it whatever you like, you could think of it whatever you want, but key to those names and thoughts that spring through your mind should be “FAMILY FUN” because indeed the event was fun. 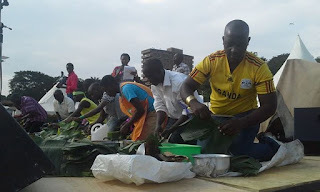 Together with invited guests, On the 21st of September which by the way was Fathers’ day in Uganda , Makerere full Gospel church congregants assembled at the Makerere University Main sports grounds for a whole day of fun activities all in the name of celebrating families within the church. To begin with, you might wonder what family fun in a church is all about. As a church, Makerere Full gospel embraces a culture where members of the church frequently gather to share and learn from each other spiritually, socially, academically and many more other life spheres, each and every one of these gatherings are titled a cell, and these cells are identified by zones or locations in and around Kampala (Uganda’s capital). Unique to these cells, is that members bond and grow together as a whole erupting this special thing called family, perhaps that introduction has given you an insight of what we call family. As the sun rose on the day, people arrived at the venue full of excitement all geared up in colorful casual and sports attire, the T-shirts and tops were blended with shorts, tours, jeans, track suits and lots of those that I probably set my eyes on for the first time ever. Personally, it was until 10:00a.m that I landed on the scene and found our Chief Pastor holding an introductory session. It was then that Pastor introduced different leads and pastors of the different full gospel churches all across the nation. Important about his talk was, he echoed that, over the years the church has not just birthed but has nurtured several church planters, pastors and mighty men and women of God all across the country. Shortly after, Pastor humbled every male attendee with a sermon that challenged them to respect, value and hold in high regard their wives or wives to be, Oh this struck the husbands and Fathers’ in the congregation. As for the single one’s, It was surely a wakeup call, because they learnt that somewhere in wonderland, there’s a female specie that God designed to be a good fit for every man and therefore they shouldn’t hunt for spouses through agencies or the internet. You should have seen the ladies get blown away in laughter. Right after that, the M.C took over, for a while a group of comedians rocked the show with a skit, the church’s’ youth ministry also took to the stage their voices and dance moves, and like they always do, they gave their all, they sang, danced, shook and jumped. Surely if you ever need A-class entertainment on a Sunday, don’t hesitate to catch up with the Youth Sunday at Makerere Full Gospel Church, and I mean it. Surely as the clock kept ticking, people’s tummies were on for it, so lunch break picked on, We all routed into our families to enjoy a feast. My corner probably had the tastiest of all, we had an Asian dish courtesy of our very own Cell host. It was just yummy. Just in case you think it wasn’t fun as you read along, hold your thought right there because, who brings police dogs to an event, but guess what, they were part of us on the day, and they didn’t show up to harm us, Not at all, they showed up to give us more and more fun, I loved this, Free dog entertainment we were in for. For 30 minutes we were watching how amazing these creatures can be, they would act according to the commands their instructor would shout out. If only I had a clip, you would go like, damn, why the hell didn’t you send me an invite. Finally, the long awaited competitions took center stage, the different zones that harbor the different spiritual families (cells) were to compete with one another. On ground we had the mighty Makindye where I originate and our rivals included zones and sub zones of Nakawa, Central, Kawempe and Rubaga zones. Straight up the first item on the agenda was busuuti wearing. Busuuti also locally called gomesi is the traditional cloth for women in the central region of Uganda which is occupied by Buganda the most popular tribe in the country. I watched women hurriedly wrap and tie themselves up with this cloth as though they were in war. This was then followed by Banana peeling, grown men fumbled and hustled to peel banana’s, it just got more and more interesting at this point. 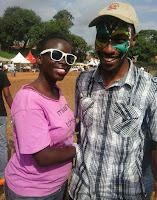 Tag of war came around, sadly I was part of the losing side on this one, even after I walked out of the my comfort zone and went on to the ground to be a team player, my energy wasn’t good enough to resist the bulls of Nakawa zone. Alas that was it for me, much as I was grilling to stick around because a few more items like penalty shoot outs and water races were yet to be done, I had had enough fun. I gave my pals high fives and signed out after having my fair share of the blast. The long awaited Mozilla African reps meet-up finally came to life, and guess what, it happened, it was fun and it was simply great. A lot can be said to complement the organizers, the participants, the facilitators and all those who were involved because, they were all awesome and indeed the event was a success. Courtesy of the Mozilla Kenyan community, on the 16th of May, Mozilla representatives all across Sub- Saharan Africa assembled in Nairobi for a 2 day meet-up during which they had a thrilling discussion of Mozilla Africa now and in the future. Following the lead of two brilliant individuals on the Mozilla Participation team i.e. Brian King @brianking and William Quiviger @wquiviger, the reps dived into a series of sessions that focused discussions around community work. Key to these discussions was a thorough SWOT analysis of the Mozilla African communities. Fundamentally, every single individual had a chance to point out at least a thing or two concerning Strengths, Weaknesses, Opportunities and Threats within their respective communities as they were represented. Thereafter, a quick brainstorm around the opportunities and viable solutions to challenges was conducted in small groups of 5.
mozilla africa now and the future. William (the facilitators) ran us through quite a lot about, the goals, the participation plan, the initiatives and the new approaches Mozilla has set as benchmarks for the year. Day Two was all about learning and sharing with one another, it all began with William’s illustration of the Reverse engineered Impact chain model [Impact-Outcome-Output-Activities-Input]. Right after, in groups of five, we applied the model to a case study about digital literacy in the Philippine. This was later then translated in the Opportunities within the African communities that we had gathered on day One. Till this point as you read along, you might wonder what was really exciting about the meet-up, We did not just spend 48 hours discussing Mozilla Africa now and its’ future but we had ample time to interact, adventure, eat, laugh and play together. There were times when fun was at its’ climax. The book of Mark, shows us how the blind man that Jesus met in Bethesida needed an extra touch for his vision to be completely restored. After Jesus had spat on his eye's, he looked up and said "I see men like trees, walking" which was simply an indication to Jesus, that he had to touch the man again for him to completely HEAL. Some times, there are segments of our lives that lack a blessing, The Lord could have moved us from point A to point B, but we feel we are supposed to be at point F. We ought to ask the Lord for just that EXTRA TOUCH for total healing or complete intervention of his blessing in those segments, therefore Let's ask the Lord for ONE MORE TOUCH in everything for our respective shortages or points of need, health, careers, confusion, provision, marriages, hopelessness, family Bond-ages, friendships, relationships name it. He'll surely restore it completely like he did for the Blind man. 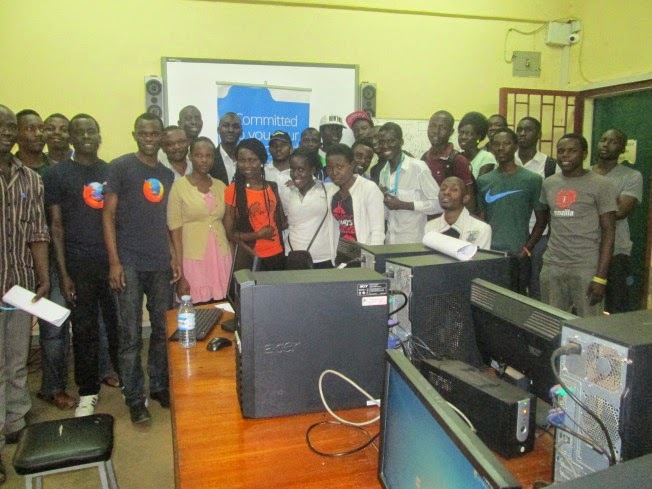 At around 11:00 am on 1st May 2015, A group of people that constituted mozillians and other random people gathered for a 3 hour session of the stumbling in a box event that was held in Makerere University Kampala Uganda. Like anyone does, I welcomed all the participants and thanked them for honoring my invite. 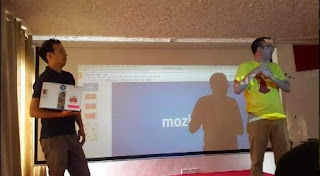 As part of our culture (mozillians), I led the customary intro about Mozilla, Talked about Mozilla as an NGO, the products, the contributors and the activities/projects it runs, and obviously not leaving behind our very own Community in the country (Mozilla Uganda Communty). Narrated the activities that the Community runs within the country, how it operates, the values and responsibilities of the representatives’ within the country and as well the achievements. Straight after freshening everyone up as far as what Mozilla is all about, We dived into the business of the day. Why we were all gathered. I geared into the core purpose of the gathering i.e. Stumbling. Oriented everyone about the Mozilla location Services. Having chosen the most ideal way for us to contribute to the service, STUMBLING session took center stage. During this session, I demoed the Mozilla stumbler application, for the readers out there interested in finding out about the app, you can get it onto your smart phone here. After which, I asked all the participants to download the application onto their phones. Shortly after every one was up to speed with the application, In groups of four, At about 12:30, we rolled out to the streets to stumble, each group took their own direction, we stumbled for about 2 hours, at about 2:30, we were all back to the venue. Stumbler's in action within Makerere University Kampala. At around 2:30p.m, we gathered to sum up our afternoon, As people uploaded the gathered wifi and cell reports on the stumbler, they took bites, drinks and interacted. And of course, for the inquisitive participants, we dialed into debates and conversations of why exactly would i have the mozilla stumbler installed on my phone. By 3 p.m, My throat had run out ....hahahaha...., .The bye's and "we meet again's" followed as people departed from the venue. It's here, It's been coming, It's now. Stumbling in a box, few could be beware of what it's all about. But listen up, Are you a student, are you a developer, are you a technology enthusiast, Do you like learning new stuff, This is your's. MOZILLA has brought to you Stumbling in a box event, A full or half day event that brings knowledge to participants on how to gather Geolocation information in their cities. The main goal being to create a global free geolocation service that can be used openly by organizations around the world to create apps and mobile services. GET INVOLVED https://location.services.mozilla.com/ And look out for the Event DAY, VENUE & PLANS on our social media website mozilla-uganda.org, twitter +Mozilla Uganda Community . In the effort to promote openness, innovation and opportunity on the web, The last quarter of 2014 saw the Mozilla Uganda team spearhead a campaign to promote openness on the web. Being part of this team, It was such an exciting project and all i could say was, "it was great". Some of the top institutions in the country were at the center of it all, this included Our very own traditional Kyambogo University, Uganda Institute of Information and Communications Technology, Ndejje University and quite a number of other institutions. The challenge the team had was to introduce, train and demonstrate to the youthful audience a powerful set of technology tools developed by the Mozilla Foundation. These are the Webmaker tools. Utilizing short, precise and direct agenda's made the task at hand much more easier for us. We gave talks about technology, demonstrated the tools, trained the students on how to use the tools then dived into practical sessions were, In small groups, students came up with a variety of web content like apps and web pages. Some of the apps were a chatroom which was chat application https://sudden-shoes-633.webmak.es/install . On behalf of the technology enthusiasts fraternity, we as Mozilla Uganda community want to shout out to not just fellow technologists, but urge the professionals, organisations and individuals in all sectors to join hands and contribute towards improving the technology infrastructure, as we all realize that day by day the significance of technology in our daily lives is becoming more and more apparent.